Do you love meat steaks? I’m sure you do. I know if I’d tell you that there is no better way to prepare a meat steak than smoking it using the best meat smokers, you’d agree. What Is The Difference Between Meat Smoking, Grilling, and Barbecuing? Without further ado, let’s start by knowing what we are talking about, a meat smoker. A meat smoker is a device used for cooking meat at a low temperature, giving it a smoke flavor in a controlled smoky environment. Depending on its size, a meat smoker can be used for outdoors and indoors smoking activities. Smokers range from charcoal-powered to those that use electricity. We also have natural gas, wood, pellets, and propane-powered meat smokers. A meat lover who hasn’t tried smoked meat yet misses out on a heavenly- tasting meat delicacy. Now, before buying a meat smoker let me brief you on important steps to effectively use it. The desired result of smoked meat is tender, well-flavored meat with a bark. For an excellent result, smoke, well-seasoned meat, and a person to monitor the smoker while smoking your meat are needed. Importantly, note that unlike grilling, smoking requires patience and maximum attention. You need to make a wise choice during purchase because there are many types of meat smokers. The best way to do this is by comparing the features of various smokers. You don’t want to buy one that loses smoke and doesn’t retain heat. Season the meat ensuring you’ve enough fuel; smoking is a long process. Place hot charcoal in the smoke box; add wood chips on it depending on the size of the smoke box. For an electric Smoker, place the wood chips on the heated coils to produce flavored smoke. Fill the water pan with water to regulate the moisture and temperature inside the smoker. Most smokers have easy to refill water pans. Improvise one if your smoker lacks a water pan. Whether using a charcoal or an electric smoker, please note that types of wood chips used majorly influence the flavor of the meat. Properly dried hardwoods are recommended for their high moisture content, burn slowly while creating more smoke with pleasant flavors while softwoods are sappy and produce clouds of smoke making your meat bitter. You need skills to correctly regulate temperature in a Charcoal Smoker. This shouldn’t worry you as most Smokers have a meat thermometer and a manual guide to help you operate. Put hot charcoal in the smoke box. Add a handful of wood chips or more depending on the size of the smoke box. Fill the water pan with water; you need to regularly refill the water pan to maintain a constant temperature. Once the smoker heats to your desired temperature, place the seasoned meat on the rack to cook. Close the door of the smoker to prevent heat and smoke loss. Monitor the smoker during the entire process. Add water to the water pan. Place wood chips on the wood tray. Place the meat on the rack. Close the door and wait for your meat to cook as you engage in other activities. You may add more wood chips with time. A meat smoker is an outdoor cooking appliance designed to cook tasty food. Wood chunks, chips, and sawdust are heated to produce smoke that holds around the meat infusing great flavor into the meat. An ideal smoker fulfills all this and is spacious enough to prepare the amount of barbecue required. There are many types of meat smokers available in the market. You can find cheap and affordable smokers as well as very expensive meat smokers. Following is a general overview of types of smokers that are widely used. These smoking appliances are easy to use and very convenient. They have computerized controls and temperature probes making them ideal for starters without experience to operate. You can also leave it unattended and still have your smoked meat. Smoker ovens are well insulated and designed with a heating element at the bottom. As the wooden chips burn, smoke rises through a piece of metal thus keeping the meat from direct heat. This helps keep the heating elements clean and stop the possibility of grease from causing a fire. These types of smokers use compacted pellets made from hardwood sawdust for fuel. They come with an interior storage bin known as hopper. A hopper is an in-built compartment where you fill the dumplings, which when burnt produces smoke and flavor for the meat. You have to set the temperature for the grill. A digital thermostatic controller adjusts the number of pellets it drops to the fire pot. Most pellet smokers are now designed to help you control temperatures right from your Smartphone. Using an electric meat smoker is a straightforward and convenient way of smoking. You will not have to monitor its operations because you can set and leave it. Electric meat smokers are excellent in bringing out the best meat flavors. These types of smokers are among the cheapest and easy to use models. Beginners can handle them comfortably. They come at affordable prices and do not require much space, which is an added advantage to those who have limited outdoor space. They have three compartments, one at the bottom level where the fire burns known as the firebox. The second level is known as water pan where water is heated and disperses the heat to the meat preventing it from drying out. The top level is the smoking chamber. The original models were created from clay, but today they are available in ceramic and metal versions. They are well insulated, and the ceramic construction makes them hold steady temperatures. You can smoke your meat at a slow mode and low temperatures if you master the technique of adjusting the vents. These smokers are made out of steel drums. They are cheap, easy to use yet produce great flavored smoked meat and are very popular for winning awards in competitions related to meat smoking. As fuel burns from the firebox below, smoke rises escaping through an opening at the top. Heat pulls in through a vent at the bottom. The more you allow more air, the hotter the flames become. In the end, all of the options above are capable of yielding surprising results. The choice rests on your palms. Choose the better meat smoker that fits your requirements. Once you find it, do not hesitate from buying it. Many people can never tell the difference between smoking, grilling, and barbecuing. The more they try to find out the more confusing it becomes. The most apparent difference in barbecuing and grilling is the quantity of heat used in cooking. Let’s analyze the differences so that you get to know what it all entails. Smoking meat takes the longest time ever. Since it is on shallow heat of 68-176 degrees, it takes about 1 hour to 2 weeks depending on temperatures. You can smoke your food for an extended period at lower temperatures. People don’t smoke food, and I bet it produces the sweetest meat. To enhance the flavor, you can marinate the chicken with a mixture of your preferred spices. You eat smoked meats while cold or at a later date. It ranges on high heat of 400-500degrees, and it only takes a few minutes to cook 5-20 minutes to be precise. You can do grilling either from a gas grill or from glowing charcoal, which emits directly below the cooking service of the grill plate. As the heat comes from one direction, you are required to overturn your meat so that it can cook evenly. When grilling, you don’t close the cover. The fat from the meat that drips to the source of heat from the grilled chicken adds flavor. The smoke that comes as a result of the dripping fat seasons the food slightly. Grilling is recommended for small and tender types of meat, for example, steaks, chops, chicken breasts, and seafood. You do this on low heat with a range of 190-300degrees, and it takes a few hours. It is the quickest to prepare, and that is the reason why Americans love it. The ideal meats for the barbecue are pork, shoulder, brisket, and ribs. These kinds of meat have a connective tissue; thus the reason behind slow cooking. The source of the heat cooks the meat indirectly. The rid of the grill or smoker is kept closed. You cook the meat through the transfer of heat called convection. The heat circulates the meat. Every process on earth has the good side and the bad side. You may ask, what are the advantages of smoking food especially meat? Are there any disadvantages of smoking meat? Let’s see. Smoking kills certain bacteria found in meat. It also slows the multiplication of other bacteria. It prevents fat from becoming stale. The smell and flavor from smoked meat are mouth-watering. The beef looks more captivating through smoking. The process requires a lot of attention and acquiring the equipment can be expensive. Due to the low moisture content in the smoker, you can’t keep the food moist. If the fire happens to be too hot, the meat can cook before being appropriately smoked. While smoking, food is contaminated with polycyclic aromatic hydrocarbons (PAHs). Experts have come up with findings that smoked food increases the chances of getting gastrointestinal cancer risks. Some nutrients like thiamin and vitamin c may get lost during smoking. You realize that there are many meat smokers in the world today. But, to be honest, not all offer the same quality services. You need to know which meat smoker does what. 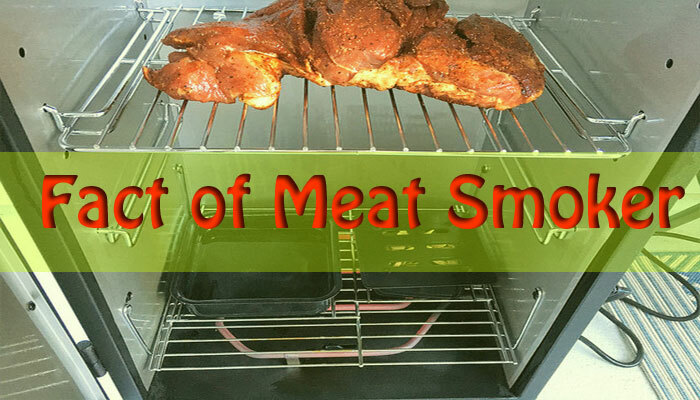 The only way to do that is by looking at this review of 6 top meat smokers that are in the market. Masterbuilt 20075315 Front Controller Smoker is a product of a well – known manufacturer, that deals with outdoor cooking equipment. The company produces cutting-edge products such as grills and smokers. They are known as Masterbuilt. These products have been in the market since 1973. Masterbuilt 20075315 Front Controller Smoker is a world-class product, with an amazing cooking capacity. It is known for producing excellent, quality products. It’s also structured in a way that allows for easy movement. This makes it possible for the smoker to be used for both outdoor and indoor activities. Smoking racks are four in number and chrome-coated. To read temperatures and cooking time we have a Blue LED display. Internal meat temperatures are monitored by a temperature probe. There is a system to load wood chip and an air damper at the side/top. Has a powerful heating element of 1,200 watts. Tremendous Cooking space of 975 sq inches. Meaning 12 whole chicken can be smoked at the same time. That is very economical. Temperatures, internal light, times, and on/off are monitored by a RF remote control. Integrated thermostat that controls internal meat temperatures for consistent, even smoking. The front drip pan is easily accessible. You are able to view your food as it cooks through the large window located at the front door of the smoker. You can add wood chips without having to open the smoker door. The autoloader is a lifesaver because it facilitates to preserve only the clean smoke inside your smoker. The fact that the Masterbuilt 20075315 Electric Smoker has wheels and handles makes it easy to move it around when need be and also makes it easy to handle as you clean. It is also very easy to clean internally, so you are assured of accessing all surfaces and no build-up of food stains. The window in door, allows you to safely monitor as the food cooks without having to open the door and losing the nice smoke that is meant to preserve food flavor and also to avoid the risk of hot steam burns. Internal light ensures you have visible full view of what is cooking inside. RF remote control to monitor on/off, internal lights, time and temperatures. Occasionally it will trip the circuit where it is plugged into. 90 day – warranty is considerably short. Weber Smokey Mountain Cookers are classic yet high-quality smokers manufactured by Weber Company. They are fueled using charcoal and have a bullet-shaped iconic design. The 18-inch smoker is their middle sized version among two others. These smokers were first introduced in 1981. Since then, Weber has improved their smokers, by adding latest features. The smokers’ longevity is a proven factor with few reports of serious problems or major malfunctions. It has three intake damper vents at the bottom. You can be opened or closed to allow air to enter the pit. Long lasting porcelain and chrome coatings on bowl, center section lid and water pan. Sturdy legs and a bowl shaped aluminum heat shield attached to them. Side door used for adding water, wood and coal. Soft grommet at the right side where you can insert a digital thermometer. A built in bi-metal thermometer on the lid. The construction materials prevent rust and handles are made of heat – resistant nylon. Nickel coated steel cooking grates. The Weber Smokey Mountain Cooker 18 inch Smokey works flawlessly and are easy to clean. They are very cost efficient and have solid construction that makes them last for years. Weber gives awesome customer care and are well stocked with parts for maintenance when required. Setting temperatures is easy and the rotating vents control the temperatures very well. The water bowl inside assist to maintain temperatures perfectly. Double-decker racks can accommodate lots of food to be cooked at one go. Smokes well producing outstanding flavor on food. The porcelain enameled steel retains heat and allows smoking to be consistent. Nickel coated cooking grates for resilience, strength, and to improve cleaning. To prevent rust build up, dampers are made from aluminum. Bowl, lid and center ring – 10 years. Plastic components – 5 years. All remaining parts – 2 years. The placement of the grills and door make it hard to add water when needed in the middle of a smoke. It’s hard to determine when to add more briquettes in a long smoke and when doing it extra care should be observed to avoid spilling ash on your food. Charcoal door is a bit too flimsy it lets in oxygen and leaks out smoke making it hard to control temperatures. Mobility is a great challenge. Nordic Ware 36550 is a versatile indoor/outdoor smoker kettle for use on grill or stove top to infuse and enhance smoky flavors on meats, sea foods, pizza, vegetables and other foods. Comes with wood chips, oak and apple flavors. Has a high dome shaped lid. Comes with an external thermometer. Comes in attractive red porcelain. Comes with imported handles for ease of use. Available in red attractive porcelain. Large enough for a large sized meal fitting. Measures 6-7/8 by 13 by 13-1/2 inches. Can be sued conveniently indoors or outdoors. Quality and tasty food with a barbecued flavor food taste. Has a high capacity due to the dome-shaped lid. Easy to clean due to the nonstick inner surfaces. Gives no visible smoke, thus is environmental friendly. Secure to use due to lids that seal tightly. Has a high efficiency and gives the desired flavor for any delicacy. Cannot cook under very high temperatures. Can cook one type of dish at a time. If subjected to very high temperatures, the red color can chip off. Oster Smoker Roaster Oven is an electric roaster, smoker and steamer all in one number one brand of the roasters. It makes and gives smoke flavor of your choice in meats, poultry and fish. It has an adjustable control feature from 150-450F. Removable pockets to hold wood chips for outdoor smoking. It can hold and roast to perfection a big turkey. It has an easily removable cooking pan and rack. It has a dome shaped lid. Exterior dimensions are, length 23.3”, height10.90”, weight 13lbs. Interior dimension are length 17.34”, height 5.69”, width 11.53”. Can be used for indoor or outdoor services. Large cooking capacity, cooking for a large group of people has never been easier. Versatile cooking options like you can choose to roast, steam or bake your meal. It has even heat distribution. Saves time, you can engage in other activities as your Oster Roaster takes care of cooking. Gives food moist and tender texture. Adds smoke flavors of your choice to food. Complete unit is a bit heavy, if too heavy ask for help when lifting or moving it. May have sharp edges when cleaning. Little Chief Front Load smoker is one of the top meat Smokers in the market that most, if not all, households should have. It is very light. The smoker is made of Aluminum and requires no assembly. It is easy to use because it comes with a booklet of recipes, cooking guides, and information on spare parts. Comes with an instruction/recipe booklet and a 1.75-pound bag of chips and chunks hickory flavor wood fuel. Has a consistently low-temperature setting using a 120V, 250V heating element for approximately 165F. Little Chief load smoker has an easy-slide Chrome-plated grill. Maximum capacity flavor fuel pan. Has a Dishwasher safe drip pan. It is durable, light and made of aluminum. Designed for outdoor use only. It is listed with UL, CUL, and CSA. Comes with a limited warranty of 2 years to be free from manufacturing defects. Dimensions: 24-1/2″H*11-1/2″W*11-1/2″D. It can smoke up to 25 pounds of Fish or Meat. Little Chief Load Smoker meets the safety standard as it has UL and CUL certifications. Engineered for maximum ventilation of smoke. It has a front loading which loads and unloads with ease holding in all smoke during the entire operation. Has a proven track of record as it has been in use for 50 years. Light, easy to operate and needs no assembly. Comes with a booklet which has a great guide on recipes, cooking instructions and information about spare parts. Easy to clean; has a dishwasher safe drip pan at the bottom. Has adequate smoke ventilation including proper smoke circulation and good dehydration. It can smoke up to 25 pounds of meat or Fish. It is affordable compared to other meat smokers. It is very easy to add wood chips in the pan with the small door panel ensuring no heat or smoke is lost. It doesn’t have a rheostat hence unable to adjust the temperatures. It is limited to outdoor use only as it emits Carbon Monoxide, which would be harmful when used indoors. The top doesn’t come off making it impossible to adjust the pan from the top. You are required to keep on changing the wood chips hence tiresome. It can only smoke a limited capacity of Fish or meat due to its small size. Char-Broil Deluxe Electric Smoker gives you adequate space to cook various kinds of foods. It has a glass door that provides an easy display of the food you’re smoking. With its integrated meat probe, you don’t have to guess whether the meat is cooked or not. All you have to do is insert the probe in the meat, and the smoker will alert you when the meat is cooked. This meat smoker has a locking latch for a tight seal of smoke, this smoker gives your food a classic and rich flavor. It further has a warming feature that keeps the food warm inside the smoker until you’re ready to serve. It has an insulated double wall construction. It has a 1000 Inches capacity. Designed with a full-sized glass door. It has a removable food thermometer. It has a washable and removable integrated meat probe. It has a warming feature. Its smoke box has a large capacity. It can be accessed at ease through remote control. It has an easy to refill slide-in water pan that is porcelain-coated. It has a removable temperature gauge. It is constructed with adjustable smoking racks. Has an easy to read blue- led display. It has a locking latch for a tight seal of smoke. It has wheels and integrated handles for easier mobility. External measurements: 16.5-inches L*23.4-inches W*40-inches H.
Endowed with a large internal cooking space. It has the potential to cook a wide variety of meat. Its high capacity grease tray is easy to clean. It constantly holds in the temperature. It has an incredible smoke flavor because it locks in smoke and heat. It has a bigger wood chip box, which allows for a longer smoking time before refill. It has a removable temperature gauge, hence, monitoring the heat while cooking is easy. It has prolonged smoking hours. It has a warming feature that retains the warmth of the food inside the smoker until it is served. Advanced control panel with easy to read led display makes it effortless to operate. It has a dual tone finish. It is monitored digitally leaving you to engage in other activities as your meat cooks. The swelling and expansion of the door cause some leakage of smoke. Some users have challenges in adjusting the temperatures that keep on creeping high. Smoking of meat was used back in the ancient time for preservation purposes. Nonetheless, it is still being widely used today even after the emergence of new and efficient methods. Most people still use this method because it retains the original deep tasty meat aroma is possible. Choosing the excellent meat smoker for your needs is the most crucial part. Having the smoker that can gratify your needs will not only save your time but also your hard-earned cash. According to your needs, you can get a meat smoker going for $50. However, some meat smokers are costly. A meat smoker can go for up to $10,000! This offers unique features. Meat smokers that use water are popular and less expensive than complex smokers that offer similar quality taste to your meat. When serving a crowd, I recommend a top-notch smoker, which has cabinets for extra space. Purchasing is one thing, but having a warranty can be of great help in case something gets broken or stops functioning as intended. Buying a smoker with unlimited warranty is better because it covers everything about the product rather than a limited one, which covers only specific parts. Manufacturer customer support is another thing. Your product warranty is nothing if the company does not offer quality customer support. In this day and era, customer support is key and a necessity. In case you do not understand how a particular feature works, a customer care representative should be able to help. A good meat smoker should meet your basic expectations by performing the required. It should be reliable, serviceable, and durable. Having a defective meat smoker can be disappointing and be a real turnoff since it cannot deliver a well -smoked mea. Few meat smokers use wood to heat and smoke meat, but most use charcoal, electricity, or gas for heat and wood for smoke. Smokers have a water pan, which helps in regulating the heat by cooling the temperature. This is possible by closing the bottom vents to cut air supply underneath the fire or open to allow oxygen circulation to increase the temperature. A great smoker should be able to adjust the both bottom and top vents or chimney to cool the temperature. The brands that are well-rated and reviewed by customers are the best because they are tested and approved to offer of high quality services. Instead of trying something new and unique, look for what many people are buying. Learn why they want the item not any of its competitors. Smokers with a small capacity are best for home cooking, but when serving a crowd you need a relatively bigger size. How you want to smoke will have an impact on the size of your smoker, as small cubes will occupy less space than when you want to smoke a whole animal. Make sure to leave necessary space around the meat smoker to allow plenty of airflow. It is better to go for the models that offer a wider use such as smoking and grilling. Make sure the units offer what they are promising because some tend to disappoint in one department or even both. There might be other factors that you can consider but these 8 aforementioned are key. Do not continue to prepare your meat steaks the same old way that doesn’t accord you any taste. Try smoking today. You will never look back as long s you have the best meat smoker.